If you’re an early adopter and eschew print, there are probably a few things that you’ve been waiting on to transition over to new media. It’s probably been at least seven years since I’ve purchased my last newspaper, but I do sometimes ask my mom to save the circulars if I’m coming over on a Sunday. 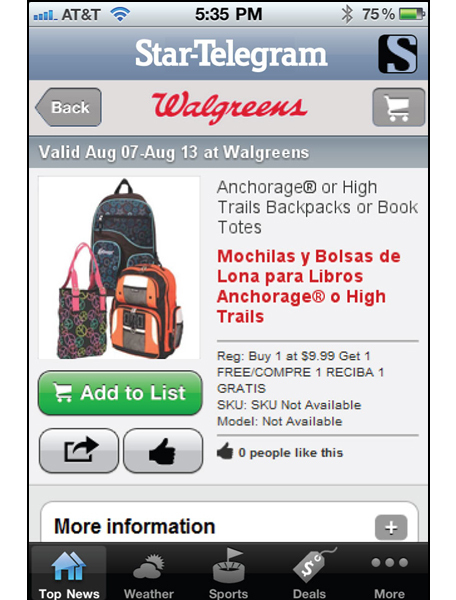 Mobile coupon apps are sorely lacking, and there hasn’t been any real major push to move the sale-notifications to a reasonably perusable tablet, phone or mobile web format. And sometimes you just need a new set of sheets, a pallet of tampons or a blender. So far, the service is running with a handful of national retailers as well as some local outfits. Bigger name participants include JCPenney, Kohl’s, Kmart, Macy’s, Staples, Target, Toys R Us, Walgreens and Wal-Mart, but the program will almost definitely expand as it catches on across the country. Participating newspapers include the Chicago Tribune, the New York Daily News, the Philadelphia Inquirer, the Dallas Morning News, the San Francisco Chronicle, the Boston Globe, and the Atlanta Journal-Constitution.